Use of this gift card constitutes acceptance of the following terms: this gift card is not redeemable or refundable for cash unless required by law; lost or stolen gift cards will not be replaced so please safeguard this gift card like cash. 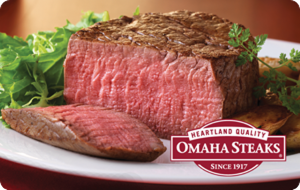 To check the balance of this gift card, please call 1-800-228-1444 or visit www.OmahaSteaks.com/giftcard. Check your balance by visiting https://www.omahasteaks.com/servlet/OnlineShopping?Dsp=280&RAND=H7560. Please allow up to 3 hours for activation.